18 Red Coca Cola Coke Soda Pop Bottle Double Neon Wall Clock Advertisement Sign. All Items BRAND NEW in ORIGINAL BOX! 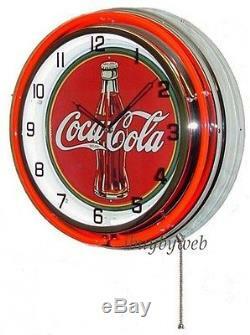 This retro neon clock features a classic Coca Cola tin sign advertisement inside with 1 Red neon tube outside and 1 White neon tube inside, which illuminates the face. The Coca Cola Neon Clock has a chromed Plastic case, tin metal face, glass cover, smooth movement and a second hand. The neon lights work on included A/C Adapter and the clock runs on one AA battery (not included). The neon lights can be turned off while the clock continues to run. Great addition to Restaurants, Diners, Bars, Rec Rooms, Game Rooms or Garages. With ON/OFF Pull chain switch. Easy to clean Glass Face. Clock: 18" diameter, 5.5" deep. Adapter plugs into any standard 110-volt outlet. Items that are initially defective within 14 days of invoice are eligible for replacement. Powered by SixBit's eCommerce Solution. The item "18 Red Coca Cola Coke Soda Pop Bottle Double Neon Wall Clock Advertisement Sign" is in sale since Thursday, June 06, 2013. This item is in the category "Collectibles\Clocks\Modern (1970-Now)\Novelty". The seller is "ibuybyweb" and is located in Los Angeles, California. This item can be shipped to United States.